There are 17 basic soccer rules that must be adhered to. 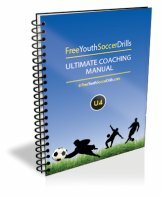 This page will briefly discuss each rule and what is expected from you as a player or coach. The field of play is the area in which the game of soccer is played. The markings must be set-out as shown below. 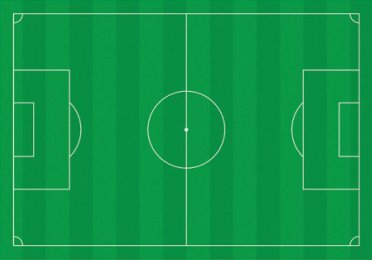 A soccer pitch needs to be between 90 and 120 meters long and 45 to 90 metres wide. The pitch must be rectangular... no square pitches allowed! There are measurements required for the goal (7.32m long and 2.44m high), center circle diameter (18.3m) and the penalty spot and goal need to be a distance of 11m perpendicular of the goal. The ball is fairly straight forward. It must have a circumference between 68cm and 70cm and a weight between 410 and 450 grams. Apart from that there is very little else required. The law states that the ball must be made of a leather type material. However, soccer balls can be bought fairly inexpensively these days from top brands and designers. According to soccer rules a team is allowed 10 outfield players and 1 goalkeeper on the field of play. They are also allowed a certain number of substitutes depending on the competition. In official tournaments and leagues only 3 substitutes may be used but up to 9 players may be named. Friendly games differ from this rule and often any number of substitutes can be named and used by a manager. Once again this is fairly standard. Soccer rules say that a player must wear a shirt/jersey, boots/cleats (other appropriate footwear), shin guards, shorts, socks and the two teams must have colors on the pitch that can be easily seperated by sight. Goalkeepers must have a different color jersey to that of their own team mates, opposing team and also the referee. A referee is vital in modern day soccer and is the main person for seeing that all of the soccer rules have been properly enforced. The center referee will have help from 2 assistant referees and a fourth official. The assistant referees (previously known as linesmen) are located at the side of the field and help the referee. 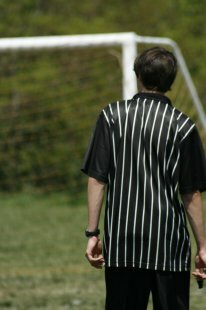 They use a flag to signal different plays from offsides, to throw-ins and corner kicks, to foul play the referee may have missed. In standard adult games the timing is limited to two 45 minute halves split by a 15 minute half-time break. Due to injuries, ball going out of play and substitutions the referee will allocate a certain amount of 'injury time' to be played at the end of each half. There are 8 reasons as to why the game of soccer can be stopped. (8) Drop ball is given when a referee stops play for an injury etc. Ball dropped from shoulder height for two players to battle for possession. Soccer rules state that the ball is in play throughout entire duration of the match until it passes a boundary line marked out on the field of play.Substitutions can only occur when the ball is out of play. As long as the ball is in play and no fouls or other infringements have been committed then a goal can be scored. 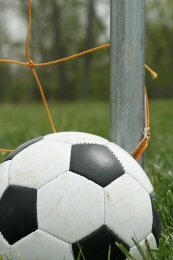 The entire circumference of the ball has to cross the goal-line for a goal to be awarded. An offside is awarded to the defending team when a pass is made by the attacking team to a team-mate when they are in an offside position. For a player to be in an offside position they must be standing nearer to their opponents' goal line than both the ball and the second last opponent. A foul is seen as accidental whereas misconduct is a deliberate breach of soccer rules. A yellow card can be given as a warning. Two yellow cards result in a player getting sent off the field of play for the entire game. A red card means a player will be sent off straight away. Free kicks were briefly mentioned in socceer rule 8 above and are fairly self-explanatory. It is important to remember that opposing players must be at least 9.15m (10yds) circumference away from the positioned ball. A penalty kick occurs when a defending player fouls an attacking player in their own penalty box. 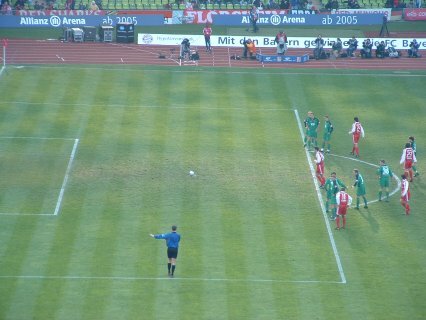 A penalty kick is taken from the penalty spot and kicked toward goal. Only the goal-keeper and penalty taker are allowed inside the penalty area. When the ball goes out from the side-lines a throw-in is awarded. The opposing team of the player who last touched ball will take the throw in. The thrower must stand behind the line, both feet on the ground and release ball once it is above their head. The goal-kick is taken when the attacking team last touched the ball over the defending teams by-line. If the ball does not leave the penalty area the goal-kick reaches a fellow team-mate in this area then the kick must be re-taken. The corner kick is taken from the corner where the defending teams goal and side-line both meet. Once again the opposing team must be 10yds back. A goal can be scored directly from a corner. Well thats it on the soccer rules. I kept it as easy to read as possible without going into more detail. If you would like more specific/detailed information on any of these soccer rules please don't hesitate to drop me an email.